I-95 Exit 6 , Martin Luther King Blvd., RR station. At the foot of the ramp take a right onto Maryland Avenue to the traffic light and make a right onto Martin Luther King Blvd. Stay in the 2nd from right lane and go past the train station (look for the clock tower) crossing Walnut Street. Martin Luther King Blvd. becomes Front St. at the train station. 1½ blocks past the train station you go under the railroad and turn into the boathouse parking area on your right. 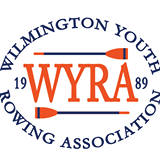 WYRA began as part of the Wilmington Rowing Club in 1989. It incorporated as the Wilmington Youth Rowing Association in 1994. WYRA (pronounced Y-RA) is a not for profit organization that offers a variety of recreational and competitive rowing programs to youngsters from Delaware and southeastern Pennsylvania . The 17,000 sq. ft. boathouse is also home to the University of Delaware crew. The WYRA boathouse is located a block and a half from the Wilmington Train Station. WYRA uses the sport of rowing as a vehicle to raise self esteem and teach responsibility, self-discipline, sportsmanship, pursuit of excellence and teamwork. Rowing is the ultimate team sport. No one is a bench warmer. Everyone rows and everyone races. WYRA crews compete in fall “head” races, long 2.5-3.5 races against the clock, winter indoor ergometer races, and traditional sprint, 1500m-2000m races in the spring. WYRA crew teams have competed in races all over the United States including Boston MA , Cape Cod MA, Princeton NJ, Pittsburg PA , Lake Lanier GA, Connecticut, Cincinnati OH and across the Atlantic in England.